I do deClaire: Burgundy Dress: The Final Ensemble and $250 Cash Giveaway! 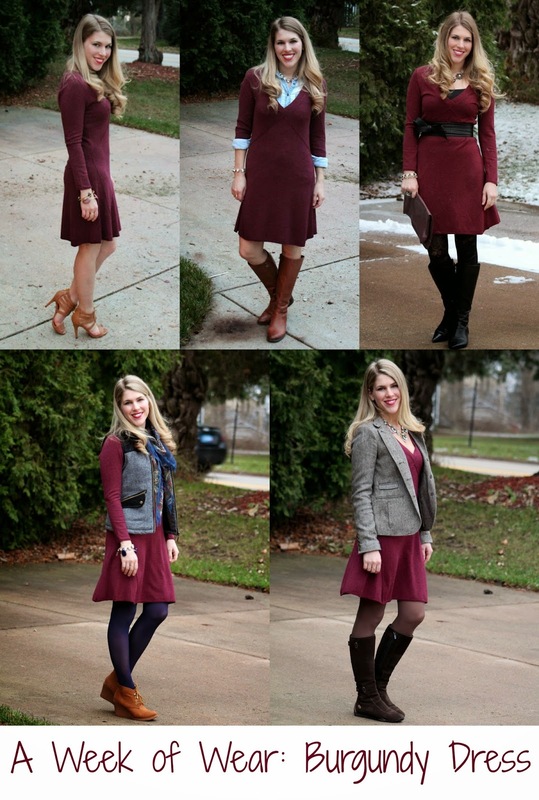 Burgundy Dress: The Final Ensemble and $250 Cash Giveaway! I've truly enjoyed styling this dress from Tulip Boutique over the past month. It's opened my eyes to my closet even more and helped me see how accessories and layering can change the look of an outfit so much. Looking at my other dresses I find myself wanting to try and remix them as well now! It just reinforces the lesson that you don't need a lot of clothes to have a lot of options. Check out Tulip on facebook, too! Now on to the final giveaway! Of course we saved the best for last! We will be giving away a $250 to one lucky person! Enter below and good luck! That dress is so versatile! Love it with the blazer! I wish that it was not sold out! You've put together so many great looks with this dress. I'd say this one might be my favorite. I really need to get a tweed blazer. you already know how in love i am with this dress. SOO pretty. You are the mix master! I love all of these looks. Which one is your favorite? I'd probably buy a ton of books! I would probably use it towards Christmas gifts for my grandsons. I would buy some boots. I would use it toward a plane ticket to visit home! YOu look beautiful in burgundy and I love the way you got so many uses from it. Love the boots too. I dont know, probably save it. ha! You did such a good job of making the dress look so different in all of these different outfits. I also think this series will be helpful to all of us who have a basic, fit-and-flare dress hanging in our closets! I would use it to pay on medical bills. take my boyfriend out to dinner, and put the rest towards some new boots. thanks! I'd put the cash towards a business suit. I'm starting business school in the fall and need to add to my business attire. I would be a bit practical with all that cash and pay my car insurance! Such a versatile dress and I love the color! Have a great weekend, Laura! I would buy a purse! :) and for pinterest my username is breeluv8. I made a mistake on the rafflecopter. I just love your outfit creativity, you're the best and remixing an item for real! I would buy black OTK boots, a plaid dress, a sequined pencil skirt and a crystal statement necklace. You did a great job styling such a pretty dress. The casual look with the vest and the dress/fancy look are y top favorites. I would update my wardrobe, it's beyond time for that! I would use the money to put towards buying new tires for my car. I love this dress! what a beautiful colour, and a classic shape. The blazer you're wearing in the first outfit is also lovely. Pay some bills and buy some Christmas presents. I would pay bills and get a present for my son! The color of that dress is so perfect My favorite style is with the vest. You know I love that vest! I would buy gifts for my daughters. I would put it toward the heating bill & groceries. I would put the cash towards holiday gifts. I would buy clothes for the kids and new shoes for my husband. I would use it towards get a Rhino lining for my husband truck. I have always wanted to do something like this and post about it. It sounds hard but you did a great job with this dress. Burgundy is such a flattering color on everyone but you look amazing in it. BTW-second picture is stunning. I'd put it toward getting my car fixed. I'd put it towards a camera. Well, if I had it right now, I would finish my Christmas shopping! I'd love to use it for airfare to surprise my mom for her birthday in January! With all that cash, I would buy my grandkids the gifts they really want. I would put it in the bank. with my newly thin and confident self!! I will be crossin' my finger for sure to win this giveaway!! Have a Great Holiday yourself! I'd probably spend it on groceries or gifts. I would put it towards a new laptop I am looking at. I would put it towards a new family computer. Ours is old and can't keep up. I would use the cash to pay bills. pay for some Christmas presents I already bought. I would buy gifts for my grandchildren. I would put it towards the down payment on my daughter's braces. thank you! It would go in our trip fund - thank you. If I won, I would put it towards Christmas gifts. This is such a pretty look! I LOVE that blazer, particularly in combination with burgundy. I'd pay off the christmas bill! It's hard to imagine that a dress can be styled in so many different ways. I think I like the first look the best, although it does look great with a chambray shirt underneath. What a fabulous post! This is a great way to show versatility and fab way to shop ones closet! Thanks for sharing Coming by today from the walking in Memphis in Heels linkup! Ill be sure to follow! You did such a great job with this! I'm impressed with all the different looks. Nice work!